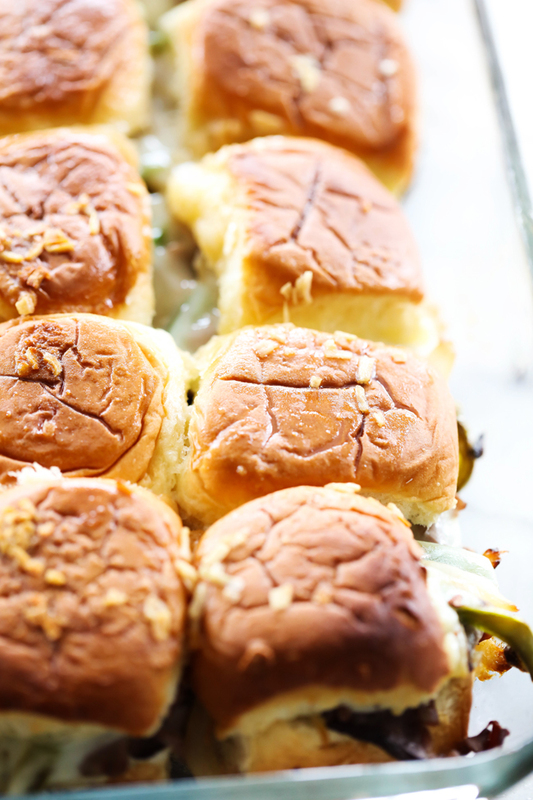 These Philly Cheese Steak Sliders are perfect for game days, parties, or dinner. They are loaded with roast beef, green peppers, provolone cheese, sautéed onions and mayonnaise. This is a meal that will please the masses and have everyone coming back for more! March Madness is around the corner and is a pretty big deal at my house! Both my husband and I get really into it and have a big bracket challenge with our friends. Game days are such a fun time to host parties and get togethers with friends and family and serve appetizers/meals that people can quickly grab and enjoy! 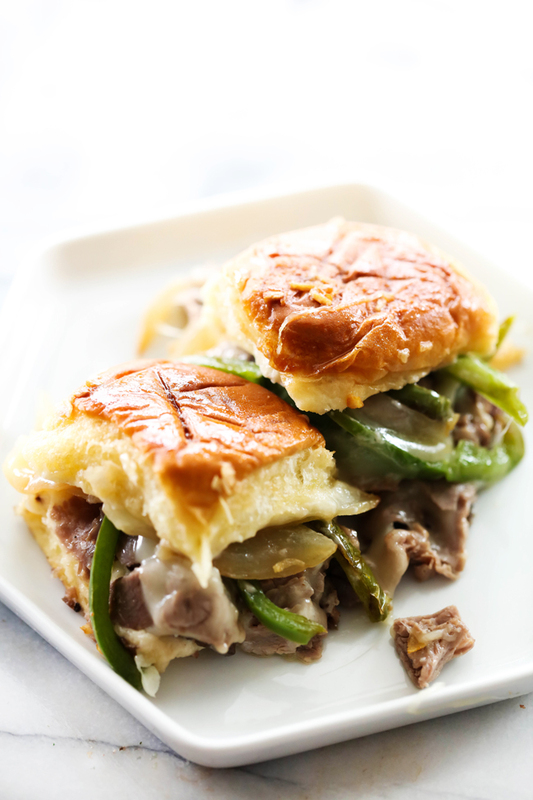 These Philly Cheese Steak Sliders are an absolute hit with all who try them and are loaded with flavor and yummy ingredients. The peppers and onions are sautéed to perfection and give them such an added element of taste. The cheese and mayo melt so beautifully over all the sandwich and is truly satisfying. In a medium skillet, add half of the oil and all the sliced onions. Cook on medium high until onions are golden brown. Remove onions. Add more oil to coat the bottom. Over medium high heat cook green bell peppers until tender. Chop deli roast beef into small bit size pieces. In a small mixing bowl, add all topping ingredients and stir well. In a small mixing bowl, combine mayonnaise, garlic powder, and salt. Mix well. Spread mayo over rolls on both sides. Place roast beef on the bottom of the rolls. Top with onions and green bell peppers. Put the top of the rolls back on. Stir topping again and then drizzle over the top of rolls. Cover slider tightly with foil and bake for 13 minutes. Remove foil and bake another 3 to 5 minutes.